Team Mak celebrates their winning idea. Pictured (left to right): Shirin Anlen, Valerie Royzman, Brittany Osteen and Cassandra Rinker. Photo by David Smith. 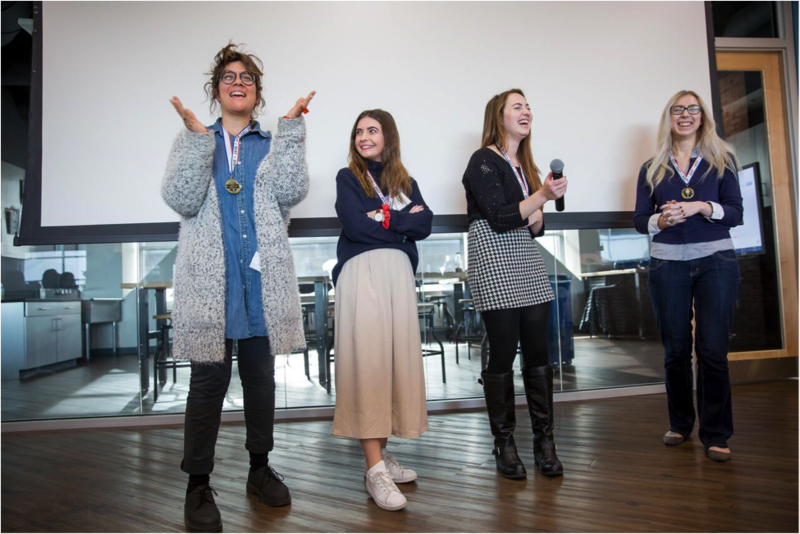 Students, faculty, and professionals from across the country joined together to innovate and diversify artificial intelligence (AI) with MediaShift and the West Virginia University Reed College of Media at the Hack the Gender Gap: Women’s Hackathon event Nov. 9-11, 2017. 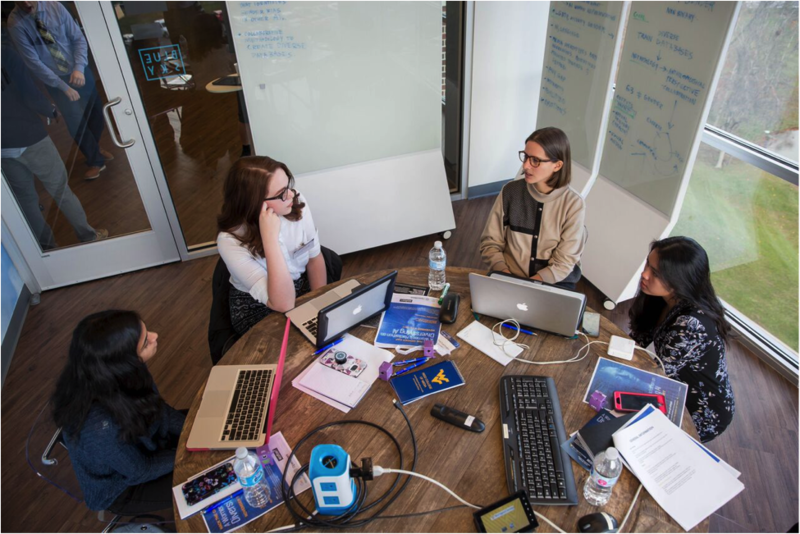 The event took place at WVU’s Media Innovation Center, and was the fourth in a series of Women’s Hackathons produced and supported by WVU and MediaShift. The challenge this time was to create a startup that included AI and media, and bridged one important gap, from gender gap to religion gap to disability gap. Day two of the Hackathon event. Pictured left to right are Christina Sivaprakasam, Bree McCullough, Josefina Buschmann and Megan Tiu. Photo by David Smith. The weekend started with an opening reception and speaker panel, meant to get creative juices flowing and bust stereotypes about artificial intelligence technology. Panelists included TrollBusters founder Michelle Ferrier, human rights attorney and social entrepreneur Flynn Coleman, and Susan Etlinger, a global expert in AI, data and digital ethics who works with the technology futurist company Altimeter. The panel and weekend events were moderated by MediaShift’s Mark Glaser and USC’s Erin Reilly, a creator, strategist, and educator who works to shine a light on diversity gaps throughout the media and tech industries. And some of those voices and perspectives were heard this weekend. Following a short breakfast on Friday morning, attendees were given a brief introduction about the rules and logistics of the event. USC Professor Amara Aguilar followed up with a short talk about some of the challenges in attempting to diversify AI in tech and media. Around the Center, several stations were set up with current AI gadgets and projects to spark ideas and display examples of the innovation that already exists. 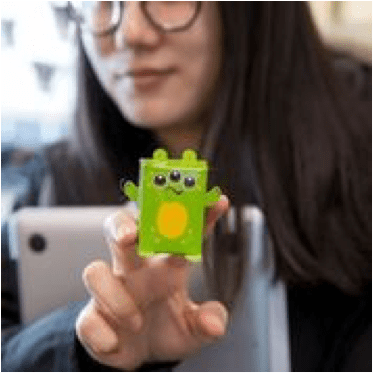 Fanyu Zuo of Loyola University Chicago holds one of the ‘bot’ team mascots given to participants during the Hackathon event. Photo by David Smith. As day one continued, several speakers added their own experience and perspectives to the mix in an attempt to keep attendees motivated and thinking about ways to make their pitch better. UX Designer Ximena Acosta shared insights on human-centered design and was followed by Megan Tiu from Frenzy.ai, who gave tips and pointers about developing business models and market plans centered around AI technology. Coffee and ideas were flowing and energy was at its peak after a long day of work. Faculty and professional mentors checked in on the teams, finding that some were struggling to tap into their creative sides. After a very long and tiring 14-hour day, participants left the Innovation Center anxious and excited about the next day’s presentations to judges. Hackathon participants hard at work during the Friday session. Photo by David Smith. On Saturday morning, crews joined together for a few short hours to finalize their pitches and presentations for the judges. One final guest speaker, Jennifer Ellis from Blackstone Launchpad USC, spoke on the importance of the pitch. 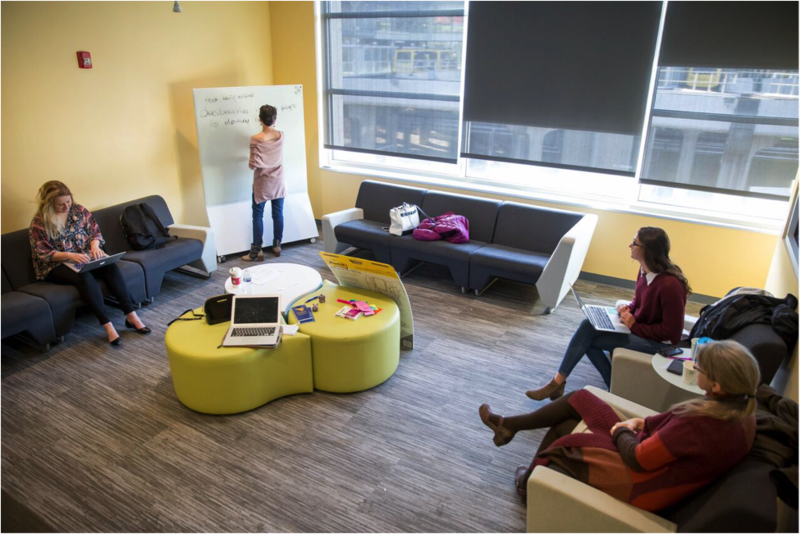 With time winding down and stress levels peaking, it was time for the teams to bring their ideas to the table. With five minutes for each pitch, teams came to the floor and presented their ideas to the judges. From AI personal medical assistants to accuracy tools meant to “call out inaccuracies and biases in the media,” these teams tossed their gaps into the air and knocked them out of the park. In the end, it was Team Mak that took home the prize with their idea for Context, individualized evaluation software meant to personalize a reading experience based on disability. The evaluative process tracks reading levels, offers different fonts, contextual images, highlights important content and breaks down text to develop a “personal reading adventure.” Team Mak offered an in-depth look at potential finances, business plans, market research, and tech specifications. The team consisted of Brittany Osteen of WVU, Shirin Anlen at MIT, Valerie Royzman at Kent State, and mentor Cassandra Rinker from WVU, who says even though her team won, the weekend felt nothing like a competition. Kassy Taylor is a graduate student in the Journalism program at West Virginia University and a student contributor to 100 Days in Appalachia. She is a dedicated storyteller and lover of all aspects of the craft. Great but images, especially under headline that include Black women is vital. (White) women does not diversity make. (yes, saw one included in the video but still images and actual inclusion are needed!!! Yes, we strive for diversity at all our events, and especially that one. The top picture includes a South Asian woman and Asian woman, our symposium included an African American speaker, and we had a good mix of students of various cultures.